A mobile recording solution, iRecord Anywhere™ utilizes the Microsoft Surface Pro 4 Tablet and integrates into the iRecord Universe, so users can automatically export files to the Evidence Vault via a wireless network. 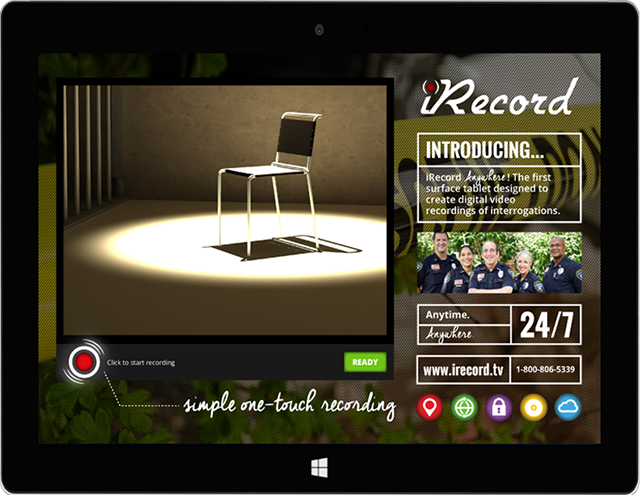 iRecord Anywhere™ creates high definition, on-demand digital video recordings. With simple touchscreen controls, users have the ability to add searchable notes and data AND easily save the recordings for playback on any PC. Handheld Tech Is Low Profile. People see it everywhere, all the time. They don’t think anything of its presence on a table, next to you on the floor, etc.. You can safely use it to record without disrupting your witnesses’ comfort or impeding their narrative. Tablets Are Easy To Position. Because handheld devices aren’t fixed, you can position them in the spot where they will unobtrusively capture every detail of your conversation. This means that conducting an interview in an unconventional location can even yield improved results compared to a traditional interview setting. Tablets Can Be Used In The Field. This can be helpful for a variety of reasons. Parents or guardians might be nervous about bringing children to a center for interviewing. A witness might be more comfortable in a home setting. Sometimes a witness begins narration at a time when you didn’t necessarily expect to be conducting an interview. In these cases, you want to be prepared to document as thoroughly as you would in an interview room. Simply taking notes leaves you open to accusations of coercion, or manipulating the interview. Being able to video the interview provides much-needed security for the interviewer and the witness alike. Establishing rapport and credibility with a witness is a delicate process. In the past, interviewing someone in a non-traditional setting meant bringing in a camera and setting it up. It was a more invasive procedure, one that sometimes involved an additional adult in the room. Because recording an interview is now as easy as taking out your device, you won’t have to damage the rapport you’re working so hard to build. You work hard to document incidents thoroughly, and minimize the trauma of testifying. Getting a high quality interview the first time and documenting it thoroughly protects your witnesses, especially when they’re children. Once you’ve got access to mobile digital recording, and digital archives of interviews and interrogations, you’ll wonder how you lived without them…and where else you can implement them.